Today, housebound, I am thinking of gravel. 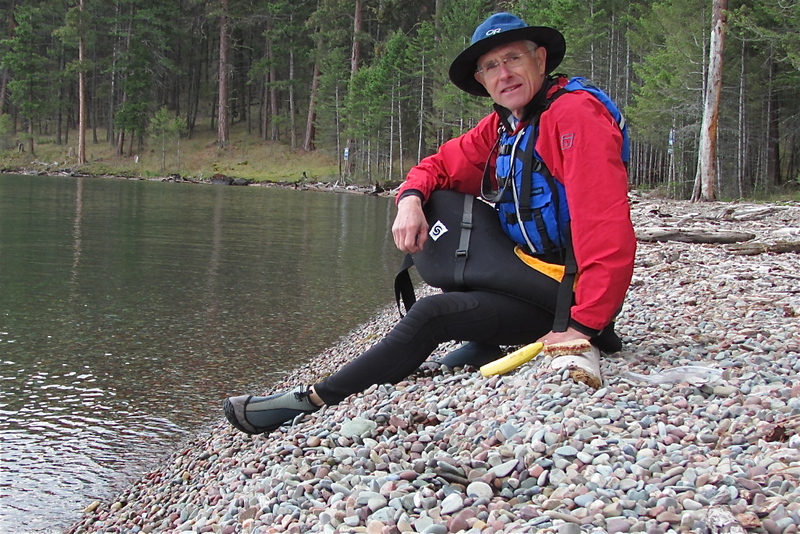 As I paddle around the lake, into its bays and coves, around its islands, I am learning where waves push rounded stones into heaps that are often hard to climb after exiting the boat. Lubricated by waves the stones slip and slide against one another, make it almost impossible to find firm footing, ground that does not give. Trying to ascend these beaches reminds me of the days after someone dies: it feels as if everything is giving way, rolling out from under foot, as if there is no way to rise. Under the lake surface gravel seems almost part of the liquid, not in suspension, but barely more solid than the water itself. I think of one particular beach on an island. One night I pulled my boat high enough so that it would not slip away. In moonlight that rose over The Missions, the night barely less hot than the day, I swam alone, open-eyed over fields of moonlit gravel, pearly light reflecting off the stones. I know a few places where the forces that produce waves and the points that resist them work together to create fans and long fingers of stones. In these places I sometimes lay my paddle across the deck, coast, reach down, and run my fingers through countless loose stones before paddling on. There are places, more exposed to the worst winter weather, where waves paw the beach, pick up stones and throw them up the beach, into cracks and crevices in logs, into pockets where limbs used to grow, onto shelves in bedrock. It may be hard to imagine the lake throwing stones, but it does. Early in this process I thought gravel was gray; but I know better now. Gravel is blue and green, red, brown, yellow, and occasionally even black. Gravel is like millions of Impressionist brush strokes, individually distinct, collectively a hue that shifts with the angle of light. I am glad that gravel is not gray in the same way I am grateful that people are not all one color. And as any child knows, water makes stones more colorful, dull in the hand, astonishing in the shallows. Each stone embodies its own story, descended from its own place, gave itself to the current of the river that brought it into the basin, let itself by pounded, ground, filed-off, perfect at each stage and on its way to becoming sand, glinting sand. Every stone has its own shape, depending on its composition, its ability to resist, its history of protection or exposure. Just like us. I also think of the sounds gravel makes. It can rattle, as when a few small stones carried into the boat by the corrugations of footwear rattle in the bottom of a dry hull. It can roar as millions of frictioning faces rub against each other in a storm. And gravel beaches can sound hollow—a mystery I still have not solved. 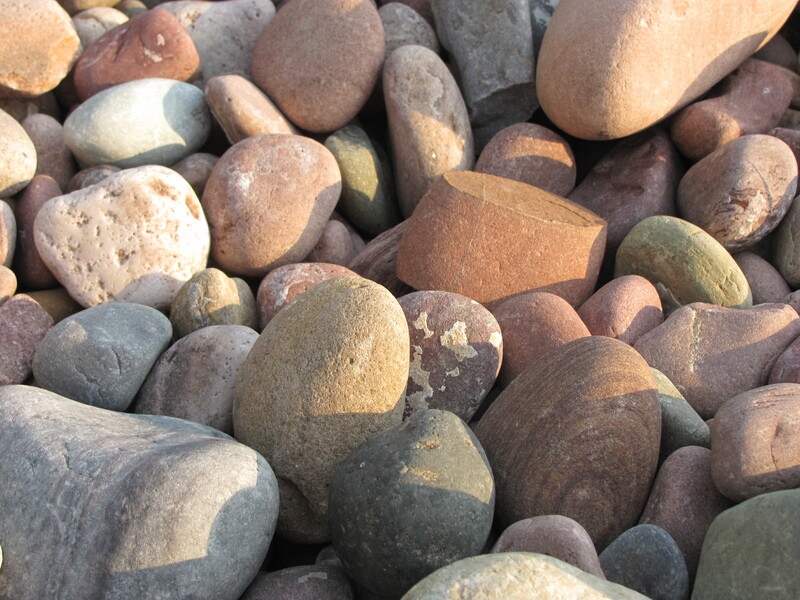 Today I sing a song of praise to all these rounded stones. This entry was posted in Late Season by kestrelgwh. Bookmark the permalink. “Trying to ascend these beaches reminds me of the days after someone dies: it feels as if everything is giving way, rolling out from under foot, as if there is no way to rise. ” What a masterful description that sentence is. Even if you aren’t a kayaker, I encourage you to read on.